We've all heard examples of animal altruism: Dogs caring for orphaned kittens, chimps sharing food or dolphins nudging injured mates to the surface. Now, a study led by the University of Colorado Boulder suggests some plants are altruistic too. The researchers looked at corn, in which each fertilized seed contained two "siblings"—an embryo and a corresponding bit of tissue known as endosperm that feeds the embryo as the seed grows, said CU-Boulder Professor Pamela Diggle. They compared the growth and behavior of the embryos and endosperm in seeds sharing the same mother and father with the growth and behavior of embryos and endosperm that had genetically different parents. "The results indicated embryos with the same mother and father as the endosperm in their seed weighed significantly more than embryos with the same mother but a different father," said Diggle, a faculty member in CU-Boulder's ecology and evolutionary biology department. "We found that endosperm that does not share the same father as the embryo does not hand over as much food—it appears to be acting less cooperatively." A paper on the subject was published during the week of Jan. 21 in the Proceedings of the National Academy of Sciences. Co-authors on the study included Chi-Chih Wu, a CU-Boulder doctoral student in the ecology and evolutionary biology department and Professor William "Ned" Friedman, a professor at Harvard University who helped conduct research on the project while a faculty member at CU-Boulder. Diggle said it is fairly clear from previous research that plants can preferentially withhold nutrients from inferior offspring when resources are limited. "Our study is the first to specifically test the idea of cooperation among siblings in plants." "One of the most fundamental laws of nature is that if you are going to be an altruist, give it up to your closest relatives," said Friedman. "Altruism only evolves if the benefactor is a close relative of the beneficiary. When the endosperm gives all of its food to the embryo and then dies, it doesn't get more altruistic than that." In corn reproduction, male flowers at the top of the plants distribute pollen grains two at a time through individual tubes to tiny cobs on the stalks covered by strands known as silks in a process known as double fertilization. When the two pollen grains come in contact with an individual silk, they produce a seed containing an embryo and endosperm. Each embryo results in just a single kernel of corn, said Diggle. The team took advantage of an extremely rare phenomenon in plants called "hetero-fertilization," in which two different fathers sire individual corn kernels, said Diggle, currently a visiting professor at Harvard. The manipulation of corn plant genes that has been going on for millennia—resulting in the production of multicolored "Indian corn" cobs of various colors like red, purple, blue and yellow—helped the researchers in assessing the parentage of the kernels, she said. 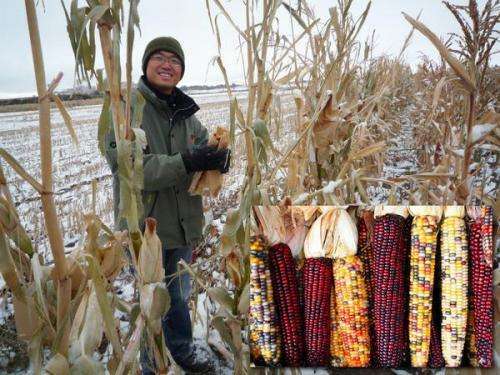 Wu, who cultivated the corn and harvested more than 100 ears over a three-year period, removed, mapped and weighed every individual kernel out of each cob from the harvests. While the majority of kernels had an endosperm and embryo of the same color—an indication they shared the same mother and father—some had different colors for each, such as a purple outer kernel with yellow embryo. Wu was searching for such rare kernels—far less than one in 100—that had two different fathers as a way to assess cooperation between the embryo and endosperm. "It was very challenging and time-consuming research," said Friedman. "It was like looking for a needle in a haystack, or in this case, a kernel in a silo." Endosperm—in the form of corn, rice, wheat and other crops—is critical to humans, providing about 70 percent of calories we consume annually worldwide. "The tissue in the seeds of flowering plants is what feeds the world," said Friedman, who also directs the Arnold Arboretum at Harvard. "If flowering plants weren't here, humans wouldn't be here." This week in Warrantless Anthropomorphism: plants. From the way they assign terms like "cooperation" and "altruism", they could just as well describe two batteries in parallel as being altruistic because the one with more voltage will share its charge with the one that has less. It isn't altruism if they have no choice but to act that way. Altruism is purely indirect selfishness, carried out for the good of survival where there's an advantage over direct selfishness. "It isn't altruism if they have no choice but to act that way." In that case there's no such thing as altruism. Also, what Silan said. I read "Can plants be autistic? You bet, study says." I didn't know plants needed any prodding to act like a vegetable! Autism manifests with a variety of symptoms. And to varying degrees. It's likely people with autism are reading this site. Saying things like this is a little insensitive. Before you can have altruism you must have the capability of making choices, which plant seeds do not possess any more than a virus has a choice over infecting its host. Human concepts such as compassion, empathy, altruism, good, bad, don't apply to things that don't even think. I think it's odd that you know the full experience of being a life form oth Our understanding of what it's like to be another organism is nearly totally incompler than human, despite the fact that you're (I assume) a human.ete. Even dogs remain a mystery to us, the nature of their internal landscape always in debate. Given that, and given that all life is more similar than dissimilar I'm hesitant to announce an absolute verdict on the internal lives of other creatures. I'm fully curious and can't wait as we possibly discover more and more extra-human languages, cultures, songs, patterns, histories, etc. Life is abundant, life is all engaged in the same fundamental processes with the same goals. Why would you presume yourself to be so very different? Firstly, that can really only be true if one were to assume that humans have free will. That seems like a big assumption. Secondly, terms like selfish and altruistic (which is really just a form of strategic selfishness in this context) are not attempting to ascribe human personalities to plants and "lower" life. They're a common way of describing the genes (selfish replicators) and the ultimate phenotypes they express. As far as I know Dawkins was the first to coin the term in "The Selfish Gene," and it has been widely used ever since. No one purports that said genes actually have these pernicious personality traits; it is a way of helping us view evolution from a genetic level (in opposition to now unpopular group selection theories). A very confusing article. The issue of Altruism is not that parents will sacrifice for children or siblings or any other that has the same genes. The issue is why do soldiers risk their lives for others. There is no apparent evolutionary advantage to do so. Recent research however has discovered that there is. The survival of the group provides a powerful survival advantage to the individual and it's genes. Such altruism has been selected for, resulting in instincts to risk for others that has now been observed in several social species. Plants?